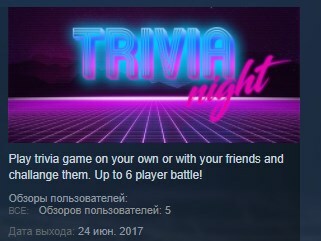 Trivia Night is a fun 80s themed quiz game. It has different game modes. You can play with your friend or on your own! Different game modes: Normal Trivia, True or False, Fun with Flags and Guess the Sound. You have two options, true or false. 50% chance. Focus because you have to decide whether the statements are true or false. Time is running out! "Was this the color of this country? Was it blue? No, no. It was purple! To which country does this flag belong?" Hope you remember correctly.